1910, 1¢ green, vertical coil, guide line pair, o.g., never hinged, attractively centered, fresh with bold color, Very Fine and choice; with 1996 P.F. certificate. 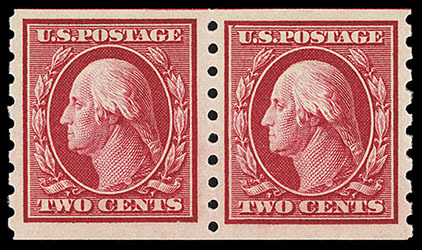 1910, 2¢ carmine, horizontal coil, pair, o.g., never hinged, deep intense color, choice centering and wide margins, Extremely Fine, a striking pair; with 1982 and 2009 P.F. certificates, the latter Graded (XF 90, SSV $475). 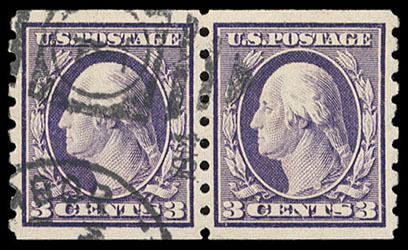 1911, 3¢ deep violet, horizontal coil, pair, town dupex cancel, beautifully centered, strong bold color, Extremely Fine.